Getting a good night’s sleep is just as important to your overall health as eating well and exercising regularly. That’s why it’s important to understand that snoring or regularly waking up tired means you probably aren’t getting the type of quality sleep you need. Getting a good night’s sleep requires more than just going to bed on time. Try following these four sleep tips to give yourself the best chance of getting consistent, quality sleep each night. And if you feel like you’re doing everything you can to get a good night’s sleep but no longer have the energy to do the things you love, there might be more to the story. Sleep apnea (also spelt sleep apnoea) affects three in 10 men and nearly two in 10 women (1). Talk to your doctor and ask about a sleep apnea test – which can be done in a sleep lab or the comfort of your own home. 1. Allocate enough time for sleep. Sleep is just as important as diet and exercise, so it’s important to allocate the right amount of time in your day for sleep and plan the rest of your schedule accordingly. Getting a good night’s sleep means 7–8 hours each night for adults (including older adults), 9–10 hours for teens, at least 10 hours for school-aged children and 11–12 hours for preschool-aged children. 2. Create consistent sleep habits. As creatures of habit, we’re usually more successful when following a routine. Sleep is no different. From your pre-sleep ritual to going to bed and waking up at the same time, you’ll find that consistency makes it easier to fall asleep each night. 3. Create a comfortable sleep environment. Make sure your bedroom is cool, quiet and comfortable – especially your bed. It may take some experimenting and an investment on your part, but finding an ultra-comfortable bed and pillow is invaluable. We spend one-third of our lives in bed, making it the one area of your life you don’t want to compromise on comfort. 4. Turn it off before bed. Whether it’s television, reading, email or texting, give yourself a nice window of time to unplug and relax before bedtime. Your body should associate your bed with sleep and these activities ramp up your brain activity rather than relaxing it. Television and bright light can also suppress melatonin production – making it difficult to fall asleep. Reference: 1. Peppard et al. Increased prevalence of sleep-disordered breathing in adults Am J Epidemiol. 2013;177(9):1006–14. If you're too tired and don't have the energy to do the things you love, there might be more to the story. Learn more about sleeping disorders here. Sleep apnea affects more than 3 in 10 men and nearly 1 in 5 women. We all know the value of sleeping well, and we've all experienced the feeling of being refreshed after a good night's sleep (and the feeling of fatigue after a poor night's sleep). But even though we know this, in our busy society, many of us are not getting the quality six to eight hours of sleep our bodies need. Understanding what happens during sleep also means understanding the sleep cycle. During the night, our bodies cycle through two recurring phases of sleep: REM (rapid eye movement) and NREM (non-REM or non-rapid eye movement). Both phases are important for different functions in our bodies. If the REM and NREM cycles are interrupted multiple times throughout the night - either due to snoring, difficulties breathing or waking up frequently throughout the night - then we miss out on vital body processes, which may affect our health and well-being not only the next day, but on a long-term basis as well (1). If this happens day after day, night after night, you can imagine the strain it would place on your, body and overall health (3). Find out how to talk to your doctor about your sleep habits. 2. Greer SI, Goldstein AN, Walker MP. The impact of sleep deprivation on food desire in the human brain. Nat Commun. 2013;4:2259. What causes snoring is a question that can be answered multiple ways. 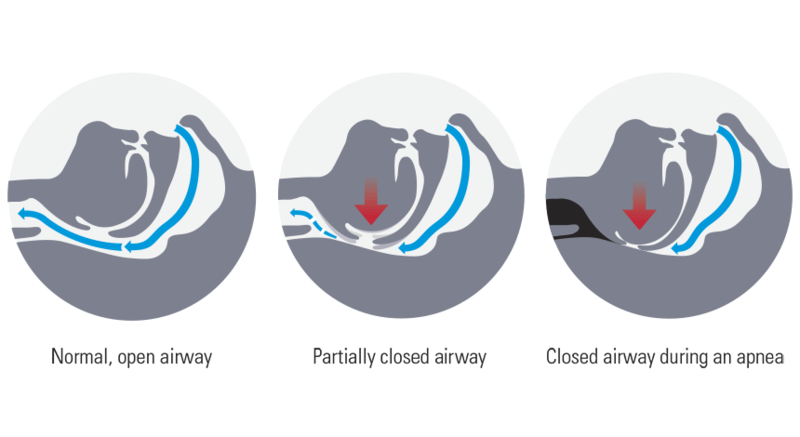 From an anatomical standpoint, snoring is caused by a partially closed upper airway (the nose and throat). Everyone’s neck muscles relax during sleep, but sometimes they relax so much that the upper airway partly closes and becomes too narrow for enough air to travel through to the lungs. Why do some people snore and others don’t? Those who have enlarged tonsils, an enlarged tongue or excess weight around the neck are more prone to snoring. And structural reasons like the shape of one’s nose or jaw can also cause snoring. The snoring sound itself is a result of the narrowing of a person’s airway, which causes a throat vibration and the snoring sound. No matter the reason, 40% of normal adults snore regularly (1), whether they realise it or not. Snoring and sleep apnea (also spelt apnoea) are linked at an alarming rate – three in 10 men and nearly two in 10 women who are habitual snorers suffer from some degree of obstructive sleep apnea (2). Sleep apnea prevents you from getting the healthy sleep you need to lead a refreshed, energetic life. So regardless of what is specifically causing snoring for you, if you snore — or if you suspect you snore — consider it a sign that something might not be right. Take our short sleep apnea quiz or find a sleep testing facility near you. 1. Ohayon MM et al. Snoring and breathing pauses during sleep: telephone interview survey of a United Kingdom population sample. BMJ. 1997;314:860–3. 2. Young T et al. The occurrence of sleep-disordered breathing among middle-aged adults. N Engl J Med 1993; 328(17):1230–5.